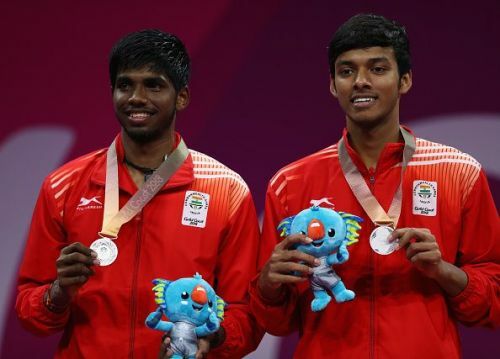 The Hyderabad Open -- a Super 100 BWF tournament last week -- turned out to be a memorable outing for India’s top men’s doubles duo of Satwiksairaj Rankireddy and Chirag Shetty. India triumphed in two of the five categories on offer, with the Rankireddy-Shetty pair capturing the men’s doubles title. The two have been on a roll for a year and a half. Fearless and confident, they have shown they are not intimidated by the big stage. The youngsters made their mark on the international circuit in their first full season of playing the Superseries tournaments, where they reached a couple of quarter-finals. This season, they made it to the semi-finals at the prestigious Indonesia Masters and the final of the Commonwealth Games. However, despite breaking into the top 20 and impressing one and all, an international title remained elusive for the currently 21st-ranked pair for 18 months. That changed at the City of Pearls last week. Sportskeeda caught up with the 21-year-old Shetty for a short chat before he and Rankireddy embark on their Japan Open campaign. Q: How does it feel to win your first BWF Super 100 title? A: It feels very good to be winning a title because this is equivalent to a Grand Prix title. So, of all the titles we have won so far, this one is the biggest. Though we played well in other tournaments like Superseries, winning a tournament gives you a different level of confidence. Q: You and Satwik have been improving by leaps and bounds. However, a title was missing since the Vietnam International in March, 2017. What does it mean to you to win one after such a long gap? A: Like I said before, winning a title is completely different than playing well. Even though competition at the Superseries level might be tough, winning a title means a lot. It indeed gives you a different kind of confidence because, at the end of the day, it indicates that you played well throughout the tournament and you won the final. Q: After the CWG, unfortunately there were a few first round losses. Do you think somewhere inside you were putting a bit of pressure on yourselves for a win after the CWG success? A: Yeah, somewhat I would say there was a bit of a pressure. I think after the CWG we had almost two months without any tournaments. For the past one-and-a-half years, we have never had such a long gap between two tournaments. That is what we did and we are now back to playing our natural game. Q: Did the big win over Rio Olympic bronze medallists Ellis and Langridge at the World Championships help to turn around things? A: Definitely! If you look at the score, we lost pretty badly in the Commonwealth Games final. We were completely clueless and they played at a very solid game. So, winning against them and that too, when we were low on confidence, was a big boost for us. After that, I think, we played really well at the World Championships. From then on, even at the Asian Games, we played well. We could have almost got the game against the Indonesians (Gideon and Sukamuljo in men’s team event) and probably might have come back with a medal. So, yes, I think, after those first few losses post-CWG, the deciding match that around the fortunes for us was the win over Langridge and Ellis. Q: How are you looking forward to the next part of the season, which is a very hectic one? A: In an athlete’s life, there are a lot of tournaments. So, there is no time to rejoice. Winning a title definitely gives you a lot of confidence. We have Japan Open now and then the China Open next week. So, we just need to focus on the upcoming tournament. Even though we have been given a tough draw, with the kind of badminton we have been playing for the past week or so, we do stand a chance to get through the first round against the Japanese (World No. 3 Kamura and Sonoda).